PlayGround Blog: PlayGround's Alumni Night Selections! PlayGround has selected the six alumni and plays to be featured in the Monday Night PlayGround season opener, Alumni Night, on Monday, September 21 at Berkeley Rep. PlayGround alumni, more than seventy strong and representing some of the Bay Area’s most distinguished new playwrights from the past two decades, were invited earlier this summer to generate original short plays inspired by the topic “Race Matters.” The top six plays will be performed in PlayGround’s signature Monday Night PlayGround script-in-hand staged reading style, performed by twenty-five leading Bay Area actors. Also that evening, PlayGround will introduce the recently-selected 2015-16 PlayGround Writers Pool and Resident Playwrights. 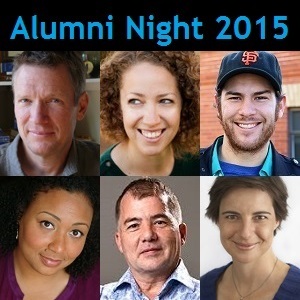 Advance tickets for Alumni Night are $15 (7-event subscriptions start at just $70 and include admission to a private Subscribers-only reception before the show) and can be purchased online at http://playground-sf.org/monday. William Bivins is excited to be returning for his fourth season with PlayGround. He has won the Bay Area Theatre Critics Circle Award for Original Script (Pulp Scripture) and the Hyperion Project Original Play Competition (Ransom, Texas). He is the recipient of a PlayGround Fellowship and two PlayGround Emerging Playwright Awards. Rachel Bublitz, an internationally produced playwright, founded the Loud & Unladylike reading festival and the 31 Plays in 31 Days Project. She’s recipient of PlayGround’s 2015 June Anne Baker Prize and is working on a new commission for PlayGround in 2015-16. Her plays include: Reading Babar In 2070 (Best of PlayGround 19), Mom’s Ham, and Of Serpents & Sea Spray. Ruben Grijalva is a San Francisco-based playwright and filmmaker. His full-length plays include Foresight (2010) and Value Over Replacement (2014), a Playground commission and 2015 O’Neill National Playwrights Conference Finalist. His films include the award winning short Shadow Ball (2007) and the upcoming short film adaptation of Value Over Replacement (2015). Genevieve Jessee is an actor and playwright based in San Diego. She received a BA degree in Theatre Arts from Dillard University, and an MFA in Playwriting from Boston University. Her work has been presented at the Source Festival, Boston Playwright's Theater, The Bay Area Playwrights Festival, The Atlanta Black Theater Festival, The San Francisco Fringe Festival and DIVAfest at The Exit theater. She was the recipient of PlayGround’s Emerging Playwright Award in 2012. Ken Prestininzi is a resident playwright at New Dramatists. In November, you can see Ken’s full length play Chaste at St. Mary’s College in Moraga, CA. In October, his play Ugmo and Eenie Go Down the Ruski Hole can be seen at Dixon Place in New York City. Reading in Bed, his previous short play with PlayGround (1998), was also presented at the Lincoln Park Center/HOME Theatre festival in New York City (Tracy Ward directing) and turned into a short film and presented at film festivals in 2009. Ken returned to San Francisco to direct The Totalitarians and T.I.C. by Peter Sinn Nachtrieb for Encore Theater and Z Space. Ken’s play Cookie Play (first developed at the Bay Area Playwrights Festival under the title As American As…) premiered at Trap Door Theater in Chicago in January 2015. Currently teaching at Connecticut College, Ken has been Artistic Director of Brown/Trinity Playwrights Rep (where he directed first productions of boom by Nachtrieb and Reunion and Indian Summer by Greg Moss) and the Associate Chair and Chair (Acting) of Playwriting at the Yale School of Drama. Mercedes Segesvary is a first generation Hungarian-American Playwright, Screenwriter and Fine Art Illustrator whose work often reflects the clashing of cultures, sexes and generations while painting colorful depictions of congruency within humanity. A founding member of the PlayGround-LA Writers Pool, her plays have been on stage in New York, San Francisco, Los Angeles, Waco TX, Madison WI and Wolfsville Nova Scotia. In 2008 she created Hugi The Great Productions to support and encourage the artistic pursuits of funky little sisters around the world. She is an MFA in Dramatic Writing for Television, Film and Theatre student at Cal State University - Los Angeles. She continues to create stories, plays, films and drawings that share her imagination with the world. PlayGround, the Bay Area’s leading playwright incubator, provides unique development opportunities for the Bay Area’s best new playwrights, including the monthly Monday Night PlayGround staged reading series, annual Best of PlayGround Festival, full-length play commissions and support for the production of new plays by local playwrights through the New Play Production Fund, among others. To date, PlayGround has supported more than 200 local playwrights in the development and staging of 730 original short plays and 55 new full-length plays, including more than a dozen that have since premiered in the Bay Area. PlayGround’s alumni have gone on to win local, national, and international honors for their short and full-length work, including recognition at the O’Neill National Playwrights Conference, Humana Festival, Sundance Festival, Bay Area Playwrights Festival, Aurora Theatre's Global Age Project, Internationalists Playwriting Prize, and New York International Fringe Festival, among others. Their works have been premiered at numerous theatres throughout the Bay Area, including: A.C.T. Costume Shop, Shotgun Players, Impact Theatre, Theatre Rhinoceros, San Jose Stage Company, Just Theater, and San Francisco Playhouse. For more information, visit http://playground-sf.org. WHAT: Monday Night PlayGround “Alumni Night,” featuring performances of the top six plays by PlayGround alumni inspired by the topic “Race Matters” and presented as script-in-hand staged readings by some of the Bay Area’s leading directors and actors. TICKETS: Advance online purchase - $15 (general admission), $10 (student), $20 (priority seating). At the door, subject to availability - $20 (general admission). 7-event Monday Night PlayGround subscriptions start at just $70 (includes invitation to a Subscribers-only Reception before the show on Sep 21). For more information about Monday Night PlayGround and Alumni Night, call (415) 992-6677 or visit www.PlayGround-sf.org/monday.